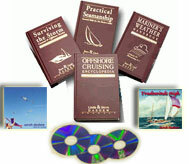 The series of books listed below are engineered to provide the information you need for successful cruising. From executive check lists to exhaustive detail, with thousands of drawings and photos, you will find the information for every budget, design type, and style of cruising. Jam-packed into 1232 pages is the latest information on 2200 subjects with 2500 detailed illustrations. Now in its tenth printing, Offshore Cruising Encyclopedia brings together in one concise, easy-to-use volume all the information you need to make the right decisions (and avoid the wrong ones) for your own style of cruising. Offshore Cruising Encyclopedia will dramatically increase your knowledge of yacht design, systems, safety, and the cruising lifestyle. 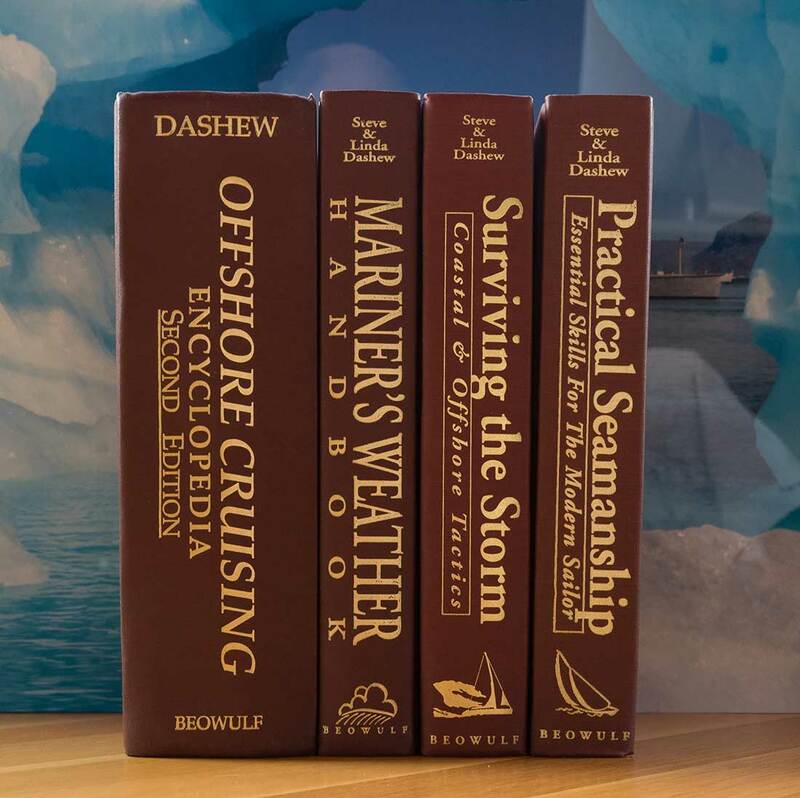 The Dashews integrate the critical factors of heavy weather safety and at-anchor cruising needs into every decision, making it possible to choose for yourself the best approach for your own cruising plans and budget. That’s why Bob Lush of Sailing Canada .says “This is a book of superlatives… obviously of great value for any owner who wants to upgrade any system.” All this information is in an easy-to-read style with a detailed cross reference index, making it one of the most usable books you’ll ever own. You don’t need a ton of money to find the right boat, outfit it, and go cruising if you know how to set your priorities. The key is being able to recognize a good situation and take advantage of it when it comes along. The Dashews will show you how to evaluate those opportunities. And when you’ve found the boat, they’ll lead you step-by-step through outfitting, covering everything from refrigeration (if you need it at all) to the right type of cushion fabrics. Want to know about schooling the kids, treating your fresh water, or preparing for medical problems? It is all there along with data on 2200 other subjects. The second edition of Offshore Cruising Encyclopedia brings together in one integrated volume the information you need to make the right decisions (and avoid the wrong ones) for your own style of cruising. And best of all, the Dashews tie these topics to the real world, both on and offshore, with an eye towards every level of budget and experience. Practical Seamanship is unique in that it is written for both novice and experienced sailors alike. It builds on your existing knowledge, augmenting all you have learned with nearly a thousand tips, techniques and warning signs, making all your cruising better. And the “essential skills” you’ll learn will make all the difference in difficult situations. As with the Steve & Linda Dashews’ other books, Practical Seamanshipexcels at making this information easily accessible and user-friendly. More than just a book, it is engineered to be used as a tool, with executive summaries, quick reference check lists and detailed indexes. You’ll refer back to it for years to come. It is an important asset and should be aboard every vessel. Another unique aspect of Practical Seamanship is that it is actually built to be taken offshore, with water resistant, commercial grade, hard cover binding and a lifetime salt-water warranty. It gets even better, as it comes with a 90-day satisfaction guarantee. At $69.95 it is a real bargain. Click here to order Practical Seamanship. Of all the things required to get ready to cruise, nothing is more important than understanding weather and the tactics required to make it work for you, and “Mariner’s Weather Handbook does for skippers at sea what the venerable Joy of Cooking does for cooks – it provides a complete and exhaustive guide to the basics of every aspect of weather you are likely to meet when cruising. Unique among weather texts, it is the fruit of years of research and more than 200,000 sea miles. It should be aboard every offshore boat, sail or power, and should be read thoroughly by every skipper.” George Day, Publisher and Editor, Bluewater Sailing. All sailors know that weather plays a critical role in the success of any journey – and no one knows this better than Steve & Linda Dashew. After 200,000 miles of cruising and a lifetime of yacht design and construction, the Dashews have learned that nothing is more important than weather. It affects everything we do, every action we take, our comfort, safety, and mental security. The vast majority of the time cruising weather is pleasant, and Mariner’s Weather Handbook is designed to help you make the most of these conditions for fast and comfortable passages. At the same time there are risk factors inherent in every weather scenario. Mariner’s Weather Handbook will teach you how to watch for the telltale signs which give early warning.You will learn how to read “between the lines” of official forecasts. All of this critical information is distilled into a user-friendly 594-page workbook covering every aspect of weather written in the clear, easily understood style. Mariner’s Weather Handbook was engineered from the very beginning to be more than just a book. It is skillfully designed with quick reference check lists and executive summaries, located right in the page margins, to help you quickly analyze and plan for what is going on with the weather where it matters most – where you are. This tool brings together for the first time the key elements of forecasting and tactics used by professional routers, forecasters, and the most successful ocean-racing navigators. You will learn how to use a frontal passage to your advantage, while minimizing discomfort. Closely guarded secrets of upper atmosphere fax charts are revealed in detail. You will learn how to make your own forecasts using just the sky, sea, wind, and barometer as well as how to make the best use of fax charts and the Internet. You will be able to tell if “official” forecasts are accurate, and if not, what to do about the developing conditions where you are. Most important, you will learn how to spot potential weather risks before they are announced. *”Thank you for the copies of Storm and Weather. I devoured them both enroute to the Seattle Safety at Sea Seminar. I found them to be The Best books on these subjects I’ve ever seen, for the blue water sailing public. I touted them very highly at the seminar, and expect you’ll get several orders from some of the 150 people in attendance. Please relay my appreciation for the books to Steve and Linda. These are very important additions to the growing literature targeted at bluewater sailing.” John Bonds, Safety at Sea educator. * To see more comments from readers and reviewers, click here. Understanding weather is the most important thing you can do to insure the success of your time on the water. And before you leave the dock is the time to get yourself up to speed. Start today by getting your copy ofMariner’s Weather Handbook and begin forecasting at home today. Click here to order Mariners Weather Handbook. For more than two decades the Dashews have studied heavy weather and how best to deal with it. They’ve interviewed sailors from around the world whose experiences, in addition to their own 200,000-plus miles at sea, form the basis of the most detailed manual on heavy weather sailing ever published. Plus you’ll learn the heavy weather secrets of 33 professionals, so you can take advantage of lessons from sailors who have survived some of the worst weather imaginable, and learn the common mistakes which cost people their lives. These lessons apply in coastal as well as offshore sailing. Surviving the Storm: Coastal & Offshore Tactics is filled with the most spectacular collection of heavy weather photographs ever assembled. 560 photos and illustrations will help you to understand the right and wrong way to deal with breaking seas, heaving to, working your way to windward, running before the storm and the use of drogues or para anchors. The emphasis throughout this book is on survival storms because, if you are prepared for the worst, normal gales and storms are no longer something to be feared – they become a chance to experiment, to test what works best on your boat. Surviving the Storm will change your definition of heavy weather. All of your cruising, even the majority which takes place in pleasant weather, will benefit. Passages will be faster and more relaxed. You and your crew will feel more comfortable with the elements. To a substantial degree, those nagging “what if?” doubts will be erased. Perhaps the most valuable lessons in Surviving the Storm come at the end, when the Dashews recap common problems that occur over and over again, around the world – problems which lead to unnecessary injury and abandonment of vessels. The vast majority of these situations occur due to lack of knowledge on the part of the skipper and crew, and need not have happened. Surviving the Storm teaches you how to avoid these mistakes. Surviving the Storm: Coastal & Offshore Tactics is filled with knowledge never before available in a book. Learn what questions to ask before buying, how to evaluate a yacht for heavy weather capability, where to place your budget priorities for maximum safety, how to choose the correct storm sails optimized for your needs, and how to get yourself and crew ready. Handling your boat in breaking seas is covered in exhaustive detail. Surviving the Storm brings together in one integrated reference, the knowledge required to make your passages safer, more comfortable, and more enjoyable – for all the members of your crew. * To read these and other reviews in full, click here. Order today with our 90-day money-back guarantee! This is the book-only version. For the CD-ROM version, or the discounted book/CD-ROM package, see “Related Items” below. Click here to order Surviving the Storm. Steve and Linda Dashew are well-known for their innovative series of big, high-speed Deerfoot and Sundeer cruising boats, and their encyclopedic reference books on cruising. Their Mariner’s Weather Handbook applies the same thorough approach to understanding marine weather that they have previously used to lead you through the maze of contradictory advice on choosing and equipping a cruising boat. This is an essential book for any cruising sailor who has even the slightest interest in developing a good understanding of weather.